Posted March 18, 2013 by William Martin & filed under Headlines. Sherlock co-creator Mark Gatiss has revealed the title for the first episode of the show’s new series. 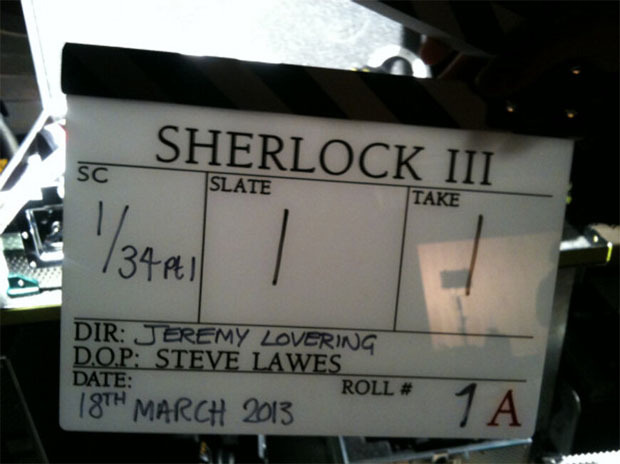 Written by Gatiss and directed by Jeremy Lovering, the episode began filming today and will be called ‘The Empty Hearse’, the writer revealed on Twitter along with a photo of a clapperboard. Last week star Benedict Cumberbatch described the episode as “an absolute stonker” and “terrific”. Cumberbatch also announced that he and Martin Freeman have signed up for a fourth series of Sherlock. > Buy the BBC’s official book, Sherlock: The Casebook, on Amazon.